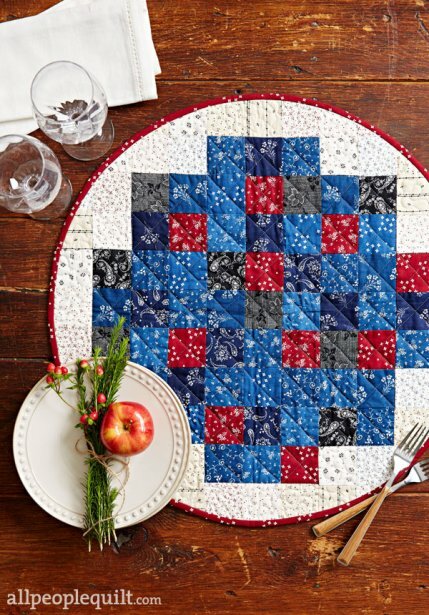 « Win a Free Copy of Quiltmaker 100 Blocks! So now I can show you the entire project!! As I mentioned the other day, so often I am working on things which will not see “the light of day” for months and months!! My Red Bird Roost pillow project appears in the Winter 2015 Issue of Quilts & More magazine, which is on newsstands NOW!! This was a really fun project to make. I used a lot of scrappy red fabrics to make the hexies (it was really FUN going through my scrap baskets for those! ), and then used them to create wide borders on the pillow. 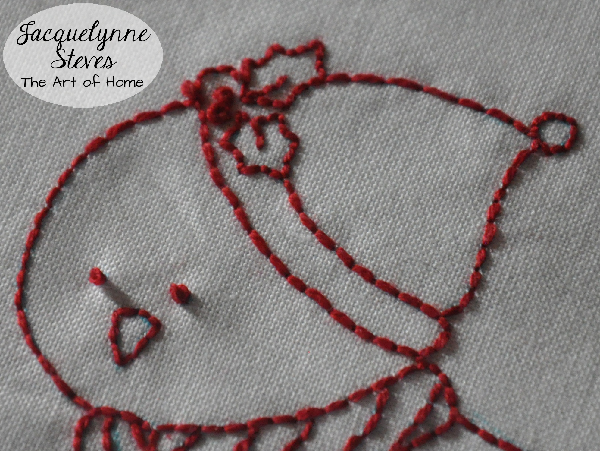 The little winter bird is done with just one embroidery floss color, and consists of simple backstitching and French knots, so it stitches up pretty quickly as far as hand embroidery projects go. 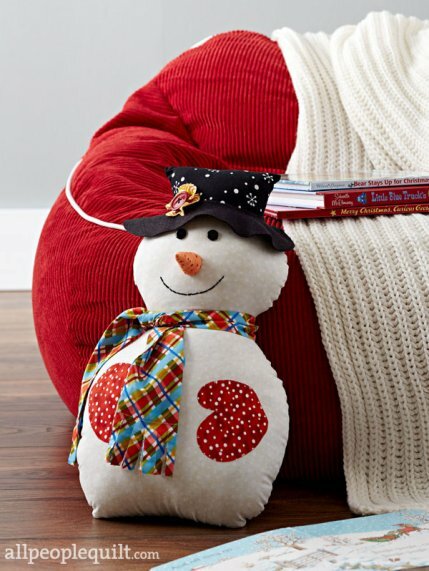 The design will take you through all of the winter holidays, right into Valentine’s Day and beyond. 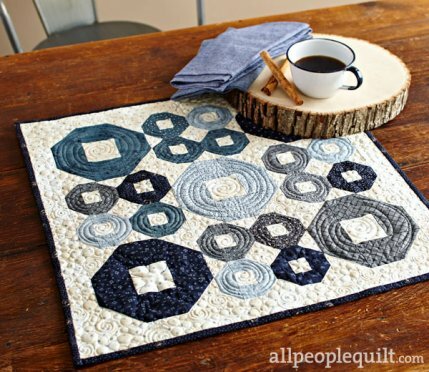 You could also do this in blues instead of reds- that’s also a wonderful winter palette! I have heard a lot of people say that this is their favorite magazine, but they have a difficult time finding the issues, because they sell out so fast! So, you have 2 options- lace up your sneakers and RUN to your local quilt shop or Barnes and Noble right this very minute to get your copy. OR, get yourself a subscription (digital subscription only) so you make sure to never miss an issue…. I’m really proud to be part of this issue… I so enjoyed flipping through it the other day, and I know you will too! This article was posted in Books & Publications, Christmas/Holiday, Crafts & DIY, Embroidery, Featured, Sewing & Quilting, Winter. Bookmark the permalink. Follow comments with the RSS feed for this post.Post a Comment or leave a trackback: Trackback URL. You are so talented! It is inspiring to see the details that you put in your design! I love making pillows because they fun and quick to make, and you can change them out so easily for different seasons! A couch runner is a great idea too! Your block and pillow are amazing! I particularly like the Redbird Roost. Such a beautiful block!! Love the redwork with the hexies!!! 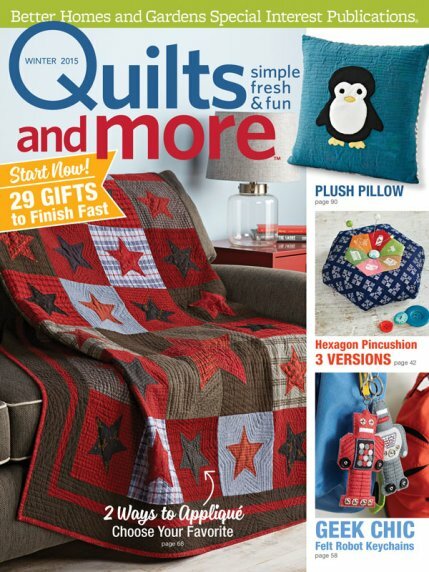 Congratulations on being in this issue of Quiltmaker! Love your design – very cute! Your block is so pretty and your embroidery is impeccable! 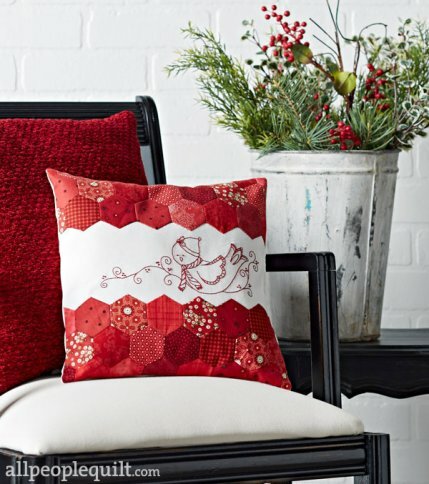 The red hexi pillow is so creative, it would make a great Christmas gift. loved this project too. i hope i get hold of a copy here. i am anxiously waiting for quilting time again due to poor health. your projects just make me want to do them right now. but this whole year has been a challenge and i am eagerly waiting to start again. send some hope and prayers along my way. I love your pillow. I haven’t done hand embroidery and didn’t think I was interested in it, but this pillow really caught my eye. Maybe I’ll need to start another project….. Your redwork is positively wonderful! 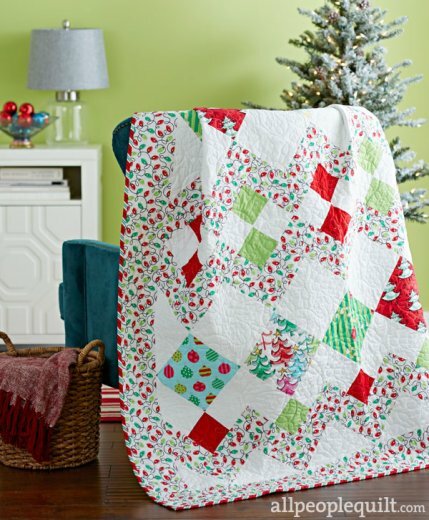 I have just finished the Cozy Afternoon quilt and am just waiting until after Christmas to start on Sweet Simplicity. Your patterns are always an inspiration and your instructions so easy to follow that everything goes together really well. Thanks for all you do….you do it so well! I have only recently found your website. What a wonderful source of inspiration. Thank you for your dedication to the creative world. Your redbird roost is darling, I need to make some Christmas pillows. You are so gifted with your stitching. I purchased the magazine and love the Redbird pillow. Do you normally use DMC floss and 2 strands of thread (as per the instructions for this project) on all your embroidery? Your backstitch is so pretty, mine are always uneven and sometimes not in a straight line like they should be. Any tips? The number of threads that I use depends on the size of the design- I almost always use 2 or 3 strands. If you were doing something really tiny, you could use one strand, and if you were doing something very large and you didn’t want the design to get lost, you could use more. DMC is very easy to find and has a wide range of colors available. 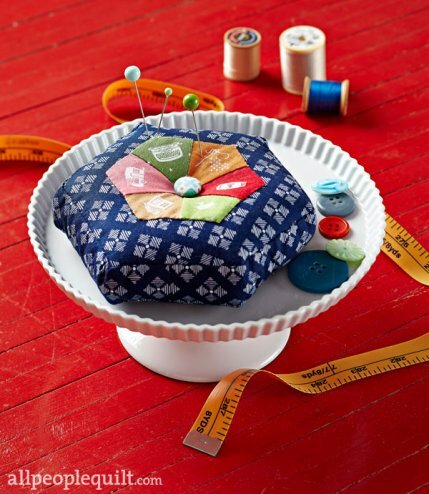 Lately, I’ve been using Aurifil embroidery floss which I really like- especially because it comes on a spool which is very easy to work with and keeps the thread from tangling! My biggest suggestion for embroidery is to make sure you have very good light, and perhaps some magnifying glasses- you can’t do nice work if you can’t see what you’re doing! And of course, practice does make perfect!! This is one craft I need to learn. Hi Linda! Please take a look at my YouTube videos for getting started with embroidery- I think you will find them helpful!